Claiming that the production cost of tea is high, with labour costs accounting for 70 percent, the PA said RPCs would have to absorb an extra 20 billion-rupee increase in wage and gratuity costs if the demand was accepted. In other words, the plantation owners are insisting that their profits, and those of their international buyers, must be defended by subjecting workers to brutal exploitation. The RPCs have agreed to increase the daily basic wage only by 20 percent, or 100 rupees, with a 33 percent increase for attendance incentives, up to 80 rupees, plus the productivity incentive and Price Share Supplement. The employers argue that the workers could thus earn 940 rupees altogether. The so-called incentive allowances are just a gimmick, however. Workers often find it difficult to earn those allowances because of physical difficulties and other impediments such as bad weather and ailments. What the employers are really demanding is the abolition of the current daily wage system and the implementation of a “revenue share” system that would transform the workers and their families into modern-day sharecroppers. Under that system, each worker’s family is allocated a plot of land, with a certain number of tea bushes to maintain and harvest. Families are paid after deductions for the costs of fertilisers and agro-chemicals provided by the company, and also the latter’s profit. Workers would lose their minimal social benefits, such as the employee provident fund, employer trust fund and gratuity. The PA statement claims that workers can earn up to 80,000 rupees per month under this new system. That has already been proved a lie. The workers on estates like the Mathurata and Kelani Valley plantations that have already implemented this system have denied those claims. They have complained that they have been unable to earn enough income to cover their living expenses, even though whole families, including children, have been compelled to work like bonded labourers. The tea industry is one of the most labour-exploitative industries in the world, providing profits for a chain of global tea companies. The top ten companies are Tata Global Beverages, Unilever, Twinings, Nestle, ITO EN INC, Barry’s Tea, Dilmah, Celestial Seasonings, Harny’s and Sons, and Republic of Tea. Professor Genevieve LeBaron, a member of the research team, told the media: “The exploitation we document is not randomly occurring abuse by a few ‘bad apples.’ Instead it is the result of structural dynamics of how global agricultural supply chains are organised. When the PA statement insisted that conceding to the workers’ demand would jeopardise “the entire value chain,” it meant all these “highly profitable companies at the helm of these supply chains” that subject workers to super-exploitation. The tea industry in Sri Lanka has faced increasing competition from other tea-producing countries like Kenya, China, India and Bangladesh. 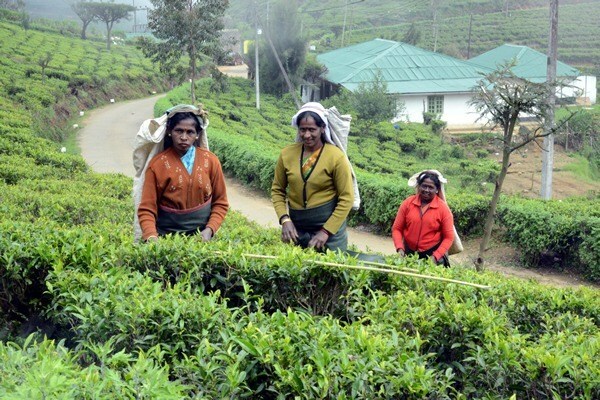 Sri Lanka’s share of the world tea production declined from 10.5 percent in 2000 to 5.4 percent last year. Due to sanctions or currency issues, the buying power of the major markets, including in Iran, Turkey and Russia, has fallen. While the average export price slightly increased by 4 percent this year, as compared to last year, the average price of Sri Lankan tea at Colombo auctions declined by 2.2 percent in the first six months of 2018. The export value has fallen by 23 percent since 2014. The PA statement urged trade unions to “work in the best interest of the industry.” That is, to subordinate the interests of workers to the interests of profit. The unions have shown their commitment to do that through their real practice. As in other sectors, the plantation unions act as industrial police forces against workers. They have agreed to implement a productivity-based wage system. The current strike was called by Ceylon Workers Congress (CWC) led by Arumugam Thondaman with the aim of letting off steam and corralling workers who are justifiably angry over their appalling working and living conditions. Thondaman and the CWC leaders are lined up with former president Mahinda Rajapakse, who was installed as prime minister on October 26 following the ousting of Ranil Wickremesinghe. Thondaman received a key ministerial post under Rajapakse. The National Union of Workers (NUW), Democratic Workers Congress (DWC) and Up Country People Front (UPF) are partners in the Wickremesinghe-led United National Front (UNF). Leaders of those unions, P. Digambaram, Mono Ganeshan and P.Radhakrishnan respectively, were ministers in the UNF government. These unions refused to join the ongoing strike, saying the 1,000-rupee demand was unjust. However, members of those unions defiantly joined the strike. The crisis of the plantation industry is a direct consequence of the crisis of capitalism. The workers are not responsible for that. The critical issues posed before the striking plantation workers are: Who should own the plantations, and how and in whose interest should they be managed? The answer is the plantations should be nationalised and operated under the democratic control of workers. This can be done only in a struggle for a workers’ and peasants’ government, which will implement socialist policies, placing the main industries, banks and other economic nerve centres under workers’ control. This is a part of a broader fight for socialism in South Asia and internationally.